Why is the 1938 version superior to the 2006 version? The older biopic gives a richer, more detailed and more accurate portrayal of court life. 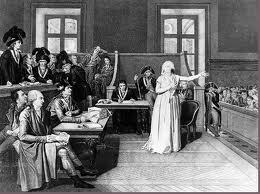 The Norma Shearer movie makes it clear that the royal court under Louis XVI and Marie Antoinette was the focus of political and social contests whose outcomes had significant and sometimes dangerous consequences. The outcomes of courtly scandals, factions and extravagances had resonances that extended beyond Versailles into Paris and the nation. The film makes it clear that the King and Queen eventually realise this, but their actions are to repair the damage occur too late. 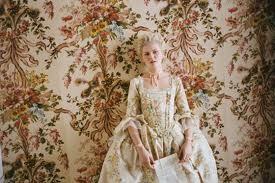 The Coppola version, by contrast, persists in treating the court as a mere playground for the privileged aristocracy. Her film shows no awareness of the court's vital function as a political battleground and pays little attention to the political actions of the royal couple. And strangely, the black and white photography as of van Dyke's movie gives the court a more regal and imposing presence than do the pastels of Coppola's version. Whereas her film's courtiers seem to be young, ineffectual but harmless, van Dyke's courtiers are older, scheming, threatening and malevolent. 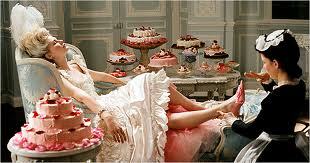 Let them eat cake and wear designer shoes.... Pink pastels dominate the settings, a motif which soon becomes bland and repetitive. The young royal couple. Unfortunately, neither appear to age or alter much during Coppola's film, unlike the 1938 version. 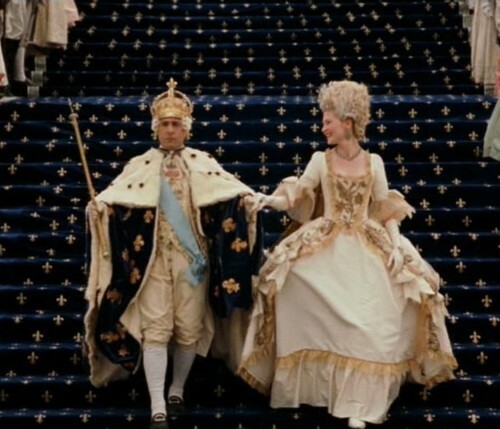 In the 2006 movie, Marie Antoinette merges into the pastel backgrounds, unlike the distinctive and assertive royal presence in the black and white version of 1938. The earlier movie provides a more thorough and perceptive portrayal of the Queen and her husband. The malevolent and dangerous social and political atmosphere of the court is found only in the 1938 film. It also encompasses a much wider emotional and political range range than the 2006 movie. Norma Shearer, as Marie Antoinette, is given more opportunities to shine as an actress than Kirsten Dunst. 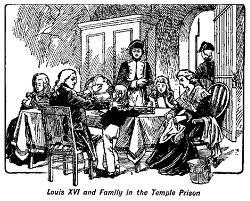 The MGM movie's depiction of the royal family's imprisonment makes an effective contrast to the luxury of Versailles. 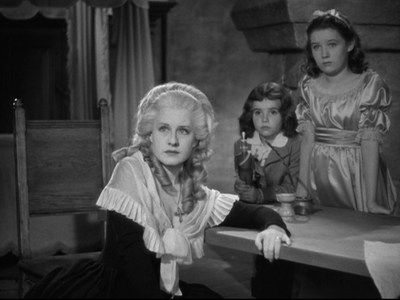 Scene from 1938 movie showing Marie Antoinette with her two children in prison. 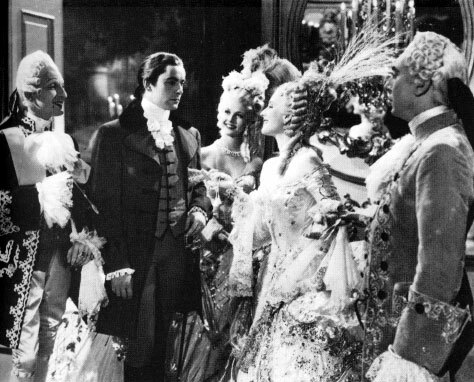 The poignancy of Marie Antoinette's last days, conveyed effectively by Shearer's performance, gives the 1938 movie a moral seriousness lacking in the 2006 version. 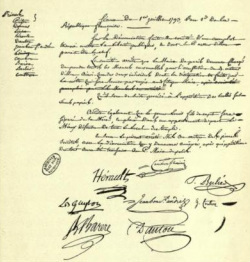 Order of the Committee of Public Safety separating the young Dauphin from his mother after the execution of Louis XVI.. The 1938 film presents the court as a world of dangerous intrigue and faction, an aspect largely ignored in the politically naive production seven decades later. The final third of the 1938 movie focused on the plight of Marie, Louis and their children as prisoners of the revolution, giving the film a tension lacking in Coppola's version, which completely ignored post-revolution events. Marie's imprisonment and trial, and her protection of her husband and children, give her character in the 1938 film a dignity and gravitas that are not found in the more recent version. 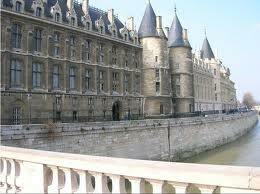 La Conciergerie is located in central Paris on the Seine. Built 1302-1313, it is well worth a visit. Essential for anyone interested in the French Revolution and Marie Antoinette. 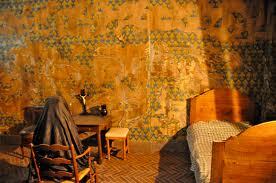 Marie Antoinette's cell in La Conciergerie. Another cell in the prison. Most cells had no bed, straw floors, with many prisoners crammed inside. Disease probably killed more than the guillotine. 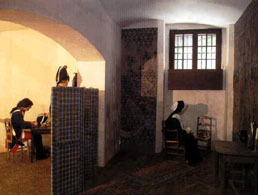 Courtyard for women prisoners at La Conciergerie. Marie Antoinette walked here. Location of La Conciergerie in Paris. Note nearest Metro -easy access.